Lake Garda has done to me what hasn’t been done to me in a very long time. I am behaving like a giddy schoolgirl. I know I am a little old for such behaviour (understatement of the year), but I can’t help it. I am in love. Head over heels in love. Lake Garda is FABULOUS. I know there are at least two other lakes that claim to be more fabulous, but I don’t need to see them. I don’t need more fabulous . …… (pause for thought) – well, of course I do, but this works just fine for me. 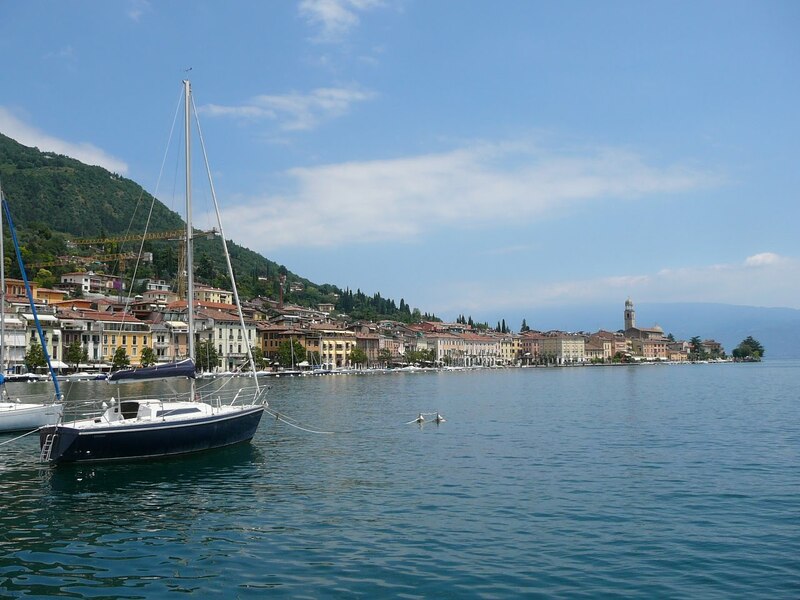 We have a drive of nearly 400 miles from Pula to Lake Garda, and we have two borders to cross. We have also just read that there are more deaths on Italian roads than in any other country, which makes us a little nervous. We don’t want to rush. Thinking it would take at least 8 hours and maybe more, we set off at the ungodly hour of 7am. But we failed to take into account that we would be driving on the Italian Autostrada, and it soon becomes apparent why the death toll is so high. The Italians drive as if getting to their destination is a matter of life or death – their life and your death. The posted speed limit is not a limit at all – it is a figure that should be taken and doubled for a minimum suggested speed. If you drive any slower than 100 miles an hour you are a severe impediment to the rest of the traffic, and subject to flashing lights and blaring horns from the cars approaching your rear at an alarming speed. If you stick to 100 miles an hour, you need never leave the slow lane. The speedometer on our small Fiat shows a top speed of 260 kilometers an hour, which we had thought was a joke. It appears not be . I am instantly transformed into a wanna be Italian and drive like a maniac. We arrive at the lake in time for an early lunch. But before we can do anything, Gordon’s fingers have to be prized off the door handle and seat belt. And as the color slowly returns to Gordon’s face, I take in the beauty of Lake Garda. It’s love at first sight. It’s irrational, I know. The place is crammed with tourists, but this is a classier crowd with not a caravan to be seen. 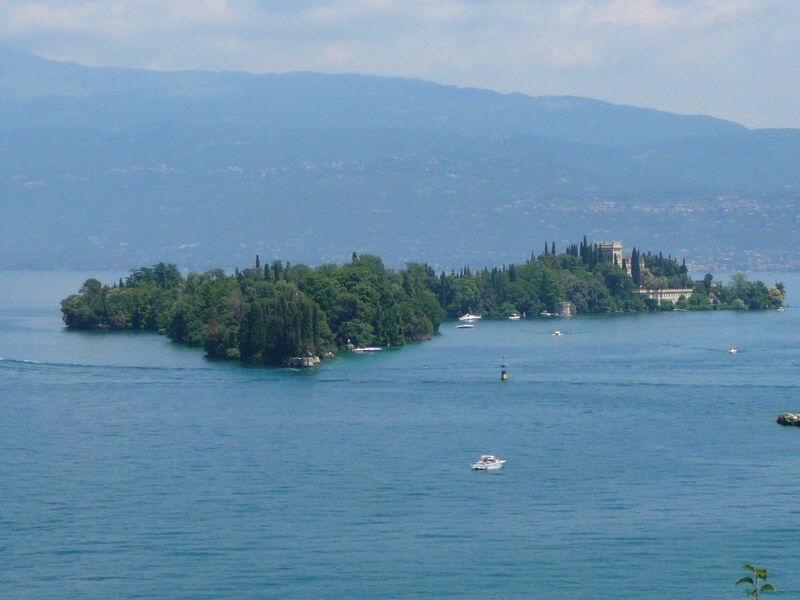 Plus, it is the Italian Lakes. I expect crowds. The small family run guest house/hotel I have booked is certainly not fancy. But none of it matters. I am in love and love is blind. Besides, I spent weeks researching Hotels on the Internet and I know that this is one of the very few that sits right on the edge of the lake. There is nothing between it and the lake but a small garden and a smaller jetty from which you can swim. I already knew it was going to be fabulous, but what I didn’t know was how fabulous! 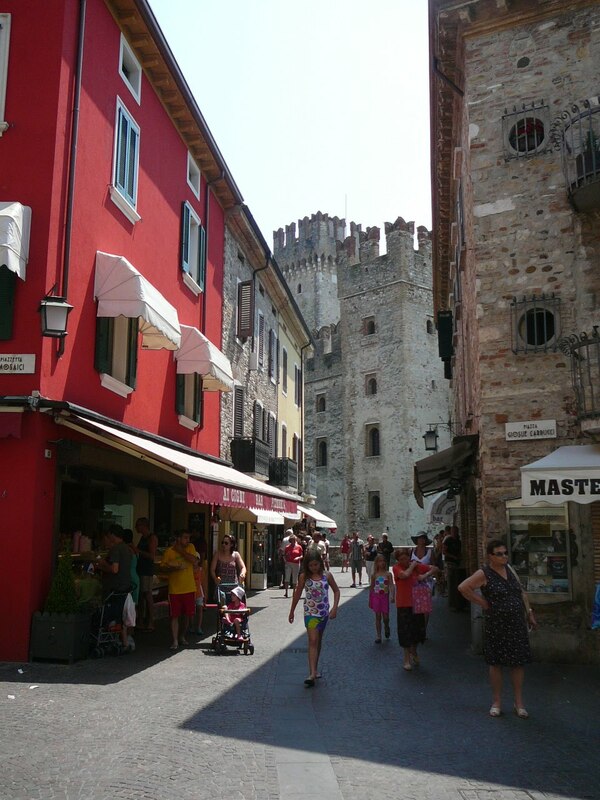 The Marconi Hotel (make a note of it, you will want to stay here) sits in the middle of the old town of Sirmione. Sirmione is on a thin finger of land pointing out into the lake. 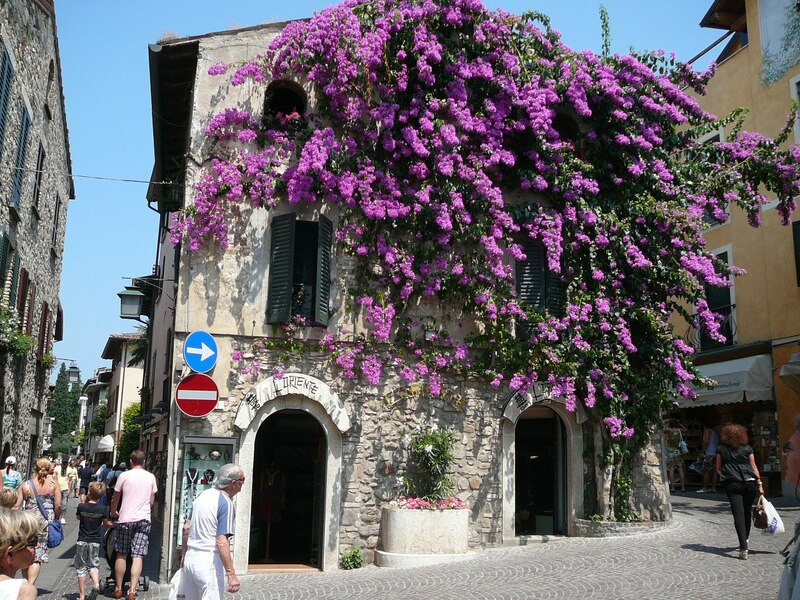 It is over a mile long and the last half of it is the old town, with narrow cobbled streets, lined with old but carefully preserved houses, painted in Mediterranean colours with contrasting shutters and window boxes full of brightly coloured flowers . The old town is pedestrian only , unless you are staying at the Marconi Hotel, in which case you can get a special pass allowing you entry. Are you beginning to see the attraction? There are many Hotels in the old town, but this is just one of a very few that has its own parking. Staying at the other hotels involves parking outside the city and walking a half mile to the hotel. There is a guard house with metal bollards across the street to prevent everyone but me from driving into the old town. The Hotel has arranged for my pass to be left with the guard and I must show it each time I enter the old town. The guard then presses a button and the metal bollards across the narrow street automatically descend into the tarmac, allowing me, and only me, to drive into the old city. How fabulous is that! 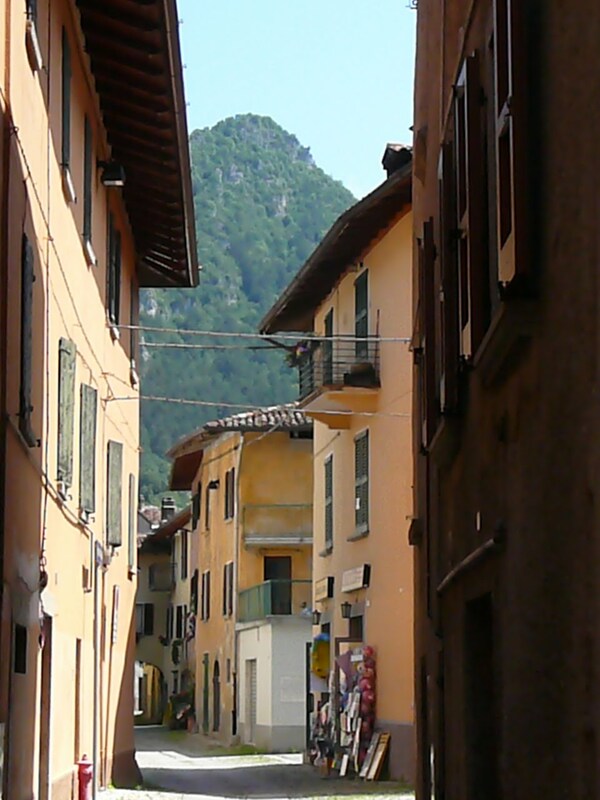 Driving through the narrow streets is also an experience not to be missed, but of course, is missed by almost everyone. There is just enough room for my car to pass through as long as the other less than fabulous tourists who have to walk , flatten themselves against the wall. I try not to look too regal as I pass by, but it’s hard. This would be a good time to have a chauffeur, I think to myself, then I could wave from the back seat. Although the streets are crowded, once you pass through the Hotel to the private lakeside garden, all is calm. The only noise comes from the many ducks and ducklings who swim by. At breakfast and lunch they sidle up to the dock and quack loudly letting you know that it is their feeding time too. They are often accompanied by three beautiful white swans who look imperiously down there noses at everything and refuse to be tempted by any of the tidbits thrown out by the Hotel guests. Is it any wonder I am in love. The small garden is full of tables and chairs , sofas and swing sets. None of the furniture has even a touch of fabulosity. But, love is blind and it doesn’t matter. Nor does it matter that few pieces of furniture match, or that the swing sets long ago lost their canvas canopy. What matters is that they are private, quiet and comfortable, and sitting in them provides the most spectacular view of the lake. The small dock manages to accommodate 10 chaises. It doesn’t matter that they are the inexpensive type with blue and white rubber slats that sag in the middle. What matters is that this is only one of three Hotels in the entire area that has a private dock for sunbathing and swimming. And of those three, this is the only one with private parking. The room itself is not large. But it doesn’t matter. What matters is that has a small balcony overlooking the lake with a table and two chairs. Again it is the only Hotel on the lake with balconies that you can sit on. It doesn’t matter that the bathroom was last remodeled in the 1950’s with lavender pink tiles and black fittings. Nor does it matter that some of the tiles are cracked. What matters is that it is spotlessly clean, with oversized fluffy white towels and a large bathtub. We haven’t seen a bath tub for almost two months. So, dear readers, you can see that this is not a Hotel that would normally impress the Fabulosity meter. But I love it and love truly is blind. 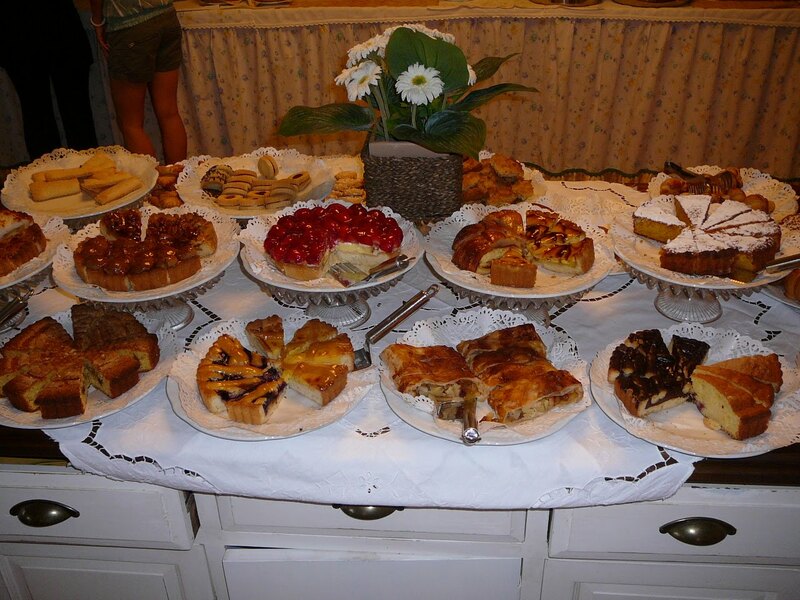 The Hotel does not impress by its glamour, instead it impresses by its welcome. And that welcome comes from the family that runs it. Mother, is a large matronly looking woman whose age it is impossible to guess,. She, like the Hotel, makes little attempt at glamour, wearing no make up or jewelery and dressing in nothing but shapeless black smocks, with her grey hair pulled back tightly behind her head . But she, like the Hotel, is comfortable and welcoming. It takes her a day to size me up, but after that I am greeted each morning with an endearing and all enveloping hug. She rattles off off her morning greetings in rapid fire Italian knowing full well that I understand nothing of what she says, but making sure that the sentiment is understood by clasping me to her ample bosom. The son is front of house. A charming man with a ready laugh and carefully projected and controlled air of ease, whom I immediately suspect might be a little light in his loafers. His controlled manner and style of dress is supposed to mislead. He dresses like an accountant in brown slacks and a green striped long sleeve shirt. But, but those little touches that no gay man can resist, give him away. The belt provides the initial clue. On the first day it is a light coloured belt with little cartoon type drawings of childrens’ noddy cars driving round it. The drawings are in green and somehow are the exact same shade of green as his shirt. To complete the image, he wears glasses, but these are way too stylish for the accountant look . The frames are cream with a green strip down the arm. And once again the green is a perfect match to the shirt. The glasses on their own could be insignificant as so many Italians wear stylish glasses. But, the next day, things become clearer. The shirt is exactly the same style as yesterdays, but with blue stripes, instead of green. The belt is white with multicoloured flags printed around it. The glasses too are the same style as yesterdays, but now have a blue stripe that matches the blue shirt. His hair is short and well groomed, but a shade of reddish brown that hints at a little help from a bottle. His eyebrows, as you might expect, exactly match his hair. It is a mannered look that whispers of a gentle difference. He, like his mother, is warm and welcoming and by the end of my stay, embracing me in large hugs. But of course it is always the intial visual attraction that causes one to fall in love. And the lake has this in spades. It is breathtakingly beautiful, and I spend 5 blissful days exploring it’s shores. There are the tourist spots that are so popular because they drip with character and charm and have that Italian flair that appeals to almost everyone. But it is also possible to find quiet spots, and tiny deserted beaches where a picnic of bread and fabulous cheeses washed down with a $2 bottle of prosecco (now that I REALLY love) can be enjoyed without interruption. 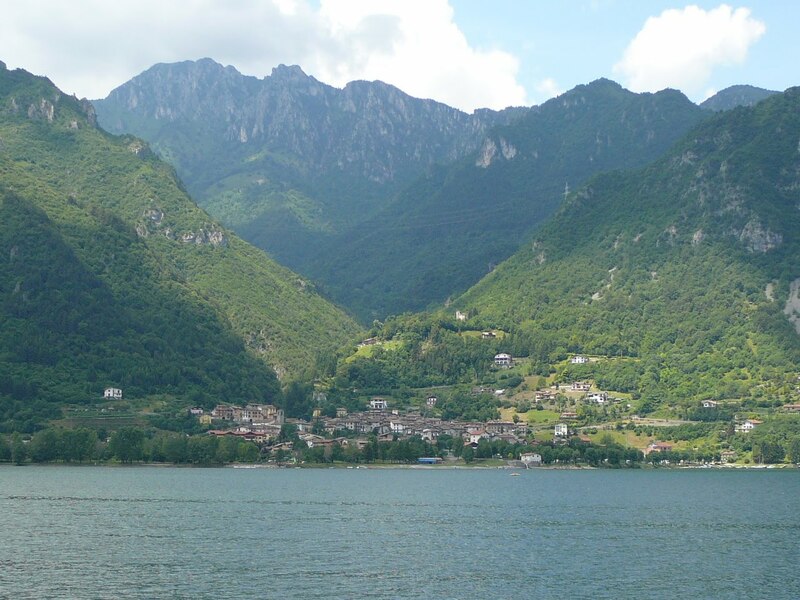 The west side of the lake is as beautiful as anywhere I have seen with huge dramatic mountains , hiding rustic villages, rushing streams, dramatic views, and tiny taverns serving fabulous pizza . Five days rush by, and it is already time to leave. As I am paying the bill, Mama comes rushing out and gives me one last hug, and then presents me with a beautiful wrapped package, that she says is “just for you”. 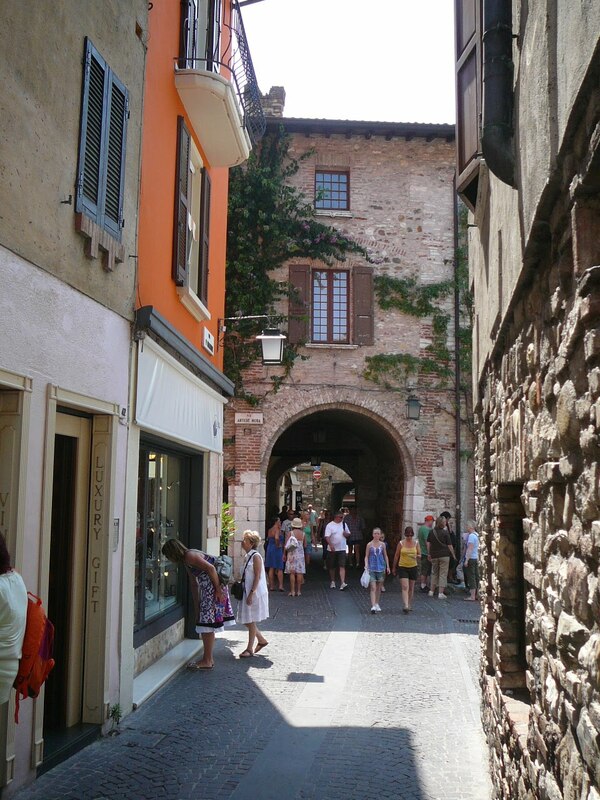 This entry was posted in Lake Garda, Marconi Hotel, Sirmione. Bookmark the permalink. At Last… Fabulosity incarnate!! It is SOOOOO you Andrew..I can almost hear the squeals of delight as that bollard descended and you (and only you) advanced onto the tarmac! An indescribable experience described beautifully.